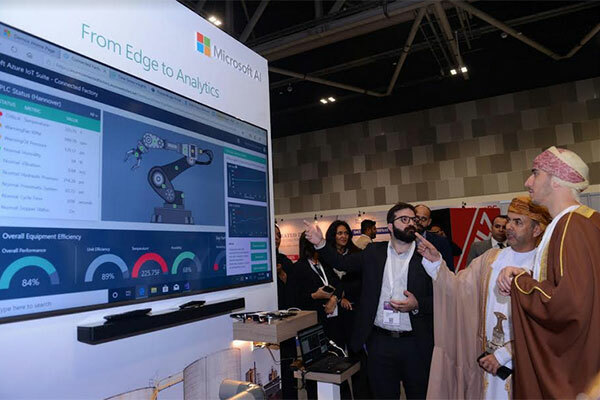 Microsoft today (March 17) demonstrated its industry-leading AI innovations at the Comex 2019, the 29th edition of Oman's premier annual ICT trade show, at the Oman Convention and Exhibition Centre in Muscat. The Microsoft stand was themed around the ability of AI to empower individuals and organisations to achieve more, be they businesses, developers or end-users. Comex 2019 runs until March 19. Some 110 exhibitors participated at the event to share ideas and get answers to pressing questions in areas such as augmented and virtual reality, cybersecurity, 3D printing, blockchain, big data, Internet of Things, smart cities, artificial intelligence, payment technologies and robotics. At Microsoft’s booth, delegates learned how they could dream big and transform their businesses by creating smart ecosystems fed by the intelligent cloud. Company experts showed how the Internet of Things can connect the intelligent cloud with the intelligent edge in real time, by staging a live demo of an IoT-connected drone controlled by cloud-based, AI. The specialists explained how governments and businesses can leverage such solutions to solve problems in areas such as construction monitoring, traffic-congestion reporting, oil-and-gas pipeline inspection and maintenance, urban planning, environmental monitoring, utility powerline inspection, asset monitoring and many others. Comex attendees also got the opportunity to get hands-on with multiple IoT- and AI-themed click-thru demos. Real-world use cases included those from fields such as manufacturing, energy, logistics, agriculture, aerospace, and oil and gas. Microsoft experts also participated in the Smart Cities & Industry 4.0 summit at Comex this year. Dave Bell, IoT technical director for Microsoft MEA, delivered a session titled ‘Introducing tomorrows innovation’s to industry 4.0’ to shed light on how Microsoft is enabling digital transformation for its customers. Steve Dunbar, IoT Commercial Director for Microsoft MEA, also spoke at the summit on the topic of Smart Buildings and highlighted the basic fundamentals for a successful smart city. Participating as the official Artificial Intelligence Partner, Microsoft also shared its presence at Comex with its partners, hosting many at its booth that demonstrated AI innovations built on the Microsoft intelligent Cloud. Link Development showcased a live demo of a solution designed to supercharge the Oman tourism sector. Company experts unveiled an end-to-end tourist platform powered by AI that will enhance the tourist journey by providing personalized experiences to book hotels, tourist attractions and so on. The platform would capture tourist feedback through cognitive services such as chatbots, facial recognition and provide sentiment analysis to evaluate their experience and drive insights to make better decisions. Microsoft Partner GULFCYBERTECH E-solutions showcased a range of solutions for various sectors and industries. These included intelligent innovations powered by AI such as e-Kart, e-Projects, e-Recruitment, e-Tenders, e-Events, e-Institute, e-Property, e-Sales and e-Vendor.